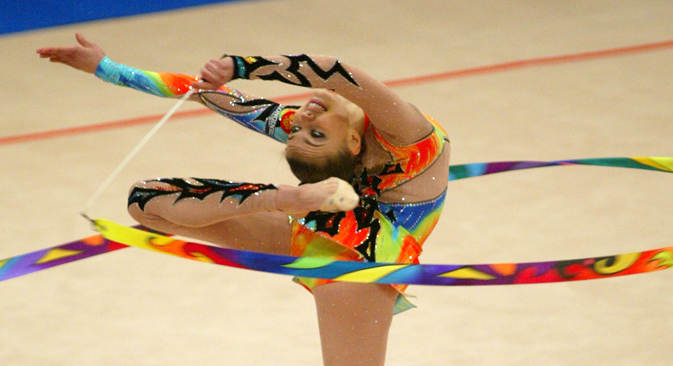 Alina Kabayeva performs with the ribbon during her routine in the team competition at the European Rhythmic Gymnastics Championship in Kiev, June 5, 2004. The donation was a Lunar New Year gift. Russia has donated $20,000 worth of sports equipment to the Cambodia Gymnastics Federation, the Phnom Penh Post reported on its website. The equipment was handed over to the federation by Dmitry Tsvetkov, the Russian ambassador to Cambodia, as a Lunar New Year gift, according to the paper. Russia is assisting the Cambodia Gymnastics Federation to popularize the sport in the kingdom.